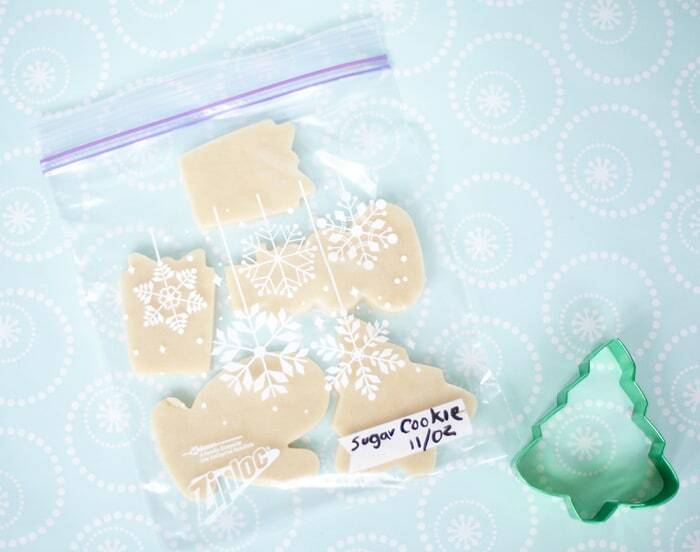 We are here to share some of our favorite tips and easy cheats for baking holiday sugar cookies. 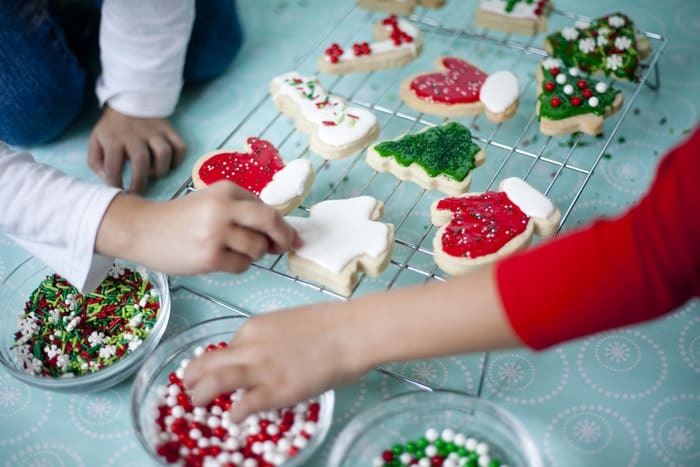 If you have been avoiding this holiday tradition, maybe this the year that you give it a try! 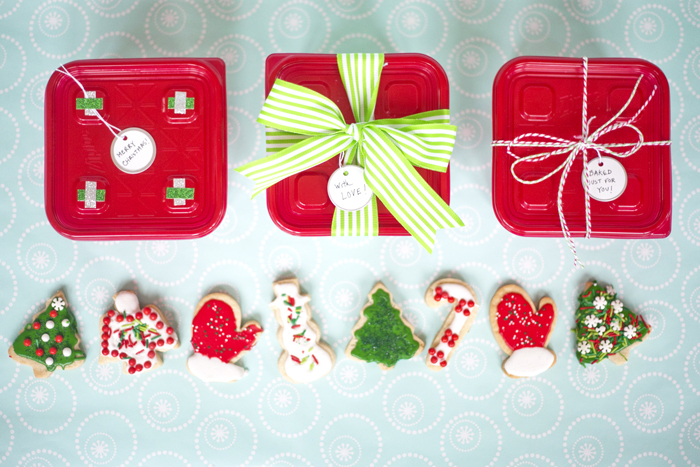 Courtesy of our friends at Ziploc®, here are 10 ways to make cookie baking, decorating and gifting stress-free and just plain fun. 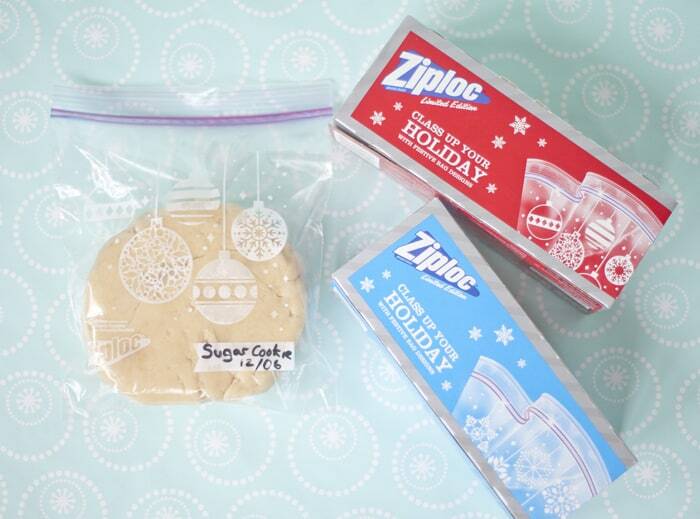 Tip #1: Prepare your favorite cookie dough recipe early and refrigerate up to three days or freeze up to 2 months ahead. 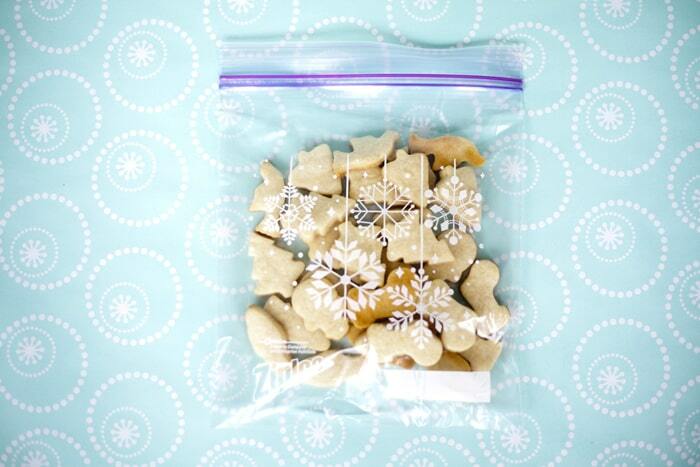 Wrap it in plastic wrap and store in a Ziploc® Holiday Storage/Freezer bag. When you are ready to bake, thaw at room temp for about 30 minutes. 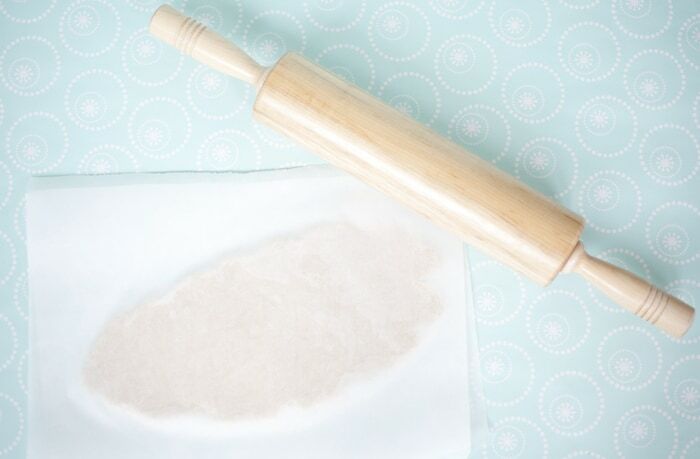 Tip #2: If you are ready to bake, roll room temperature dough out to 1/4″ thickness between two sheets of parchment paper and pop the whole thing in the freezer for 10 minutes. Peel the paper off of the front and back and cut the dough while frozen, no sticky floury messy. 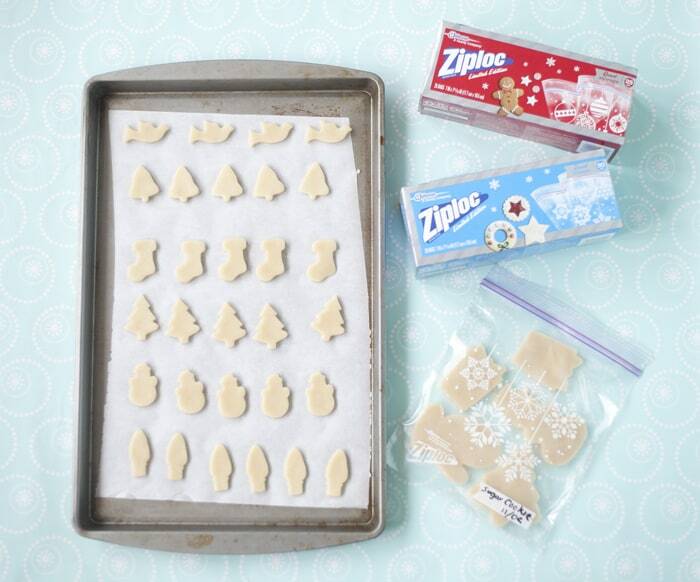 Tip #3: Place the cut cookies on a parchment paper covered cookie sheet and freeze again for 10 minutes. Cold dough holds its shape best while baking. Add 1-2 minutes to baking time. 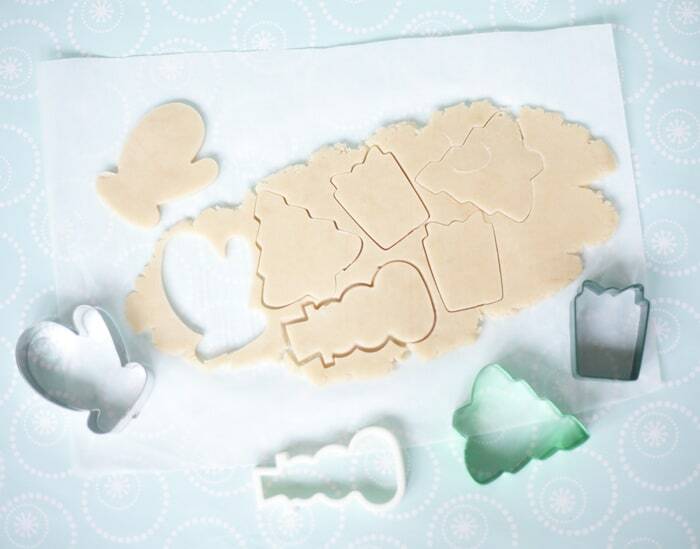 Tip #5: Bake similar size and thickness cookies together. Larger/thicker cookies take longer to bake. The cookies are done just as the bottom edge starts to turn golden. 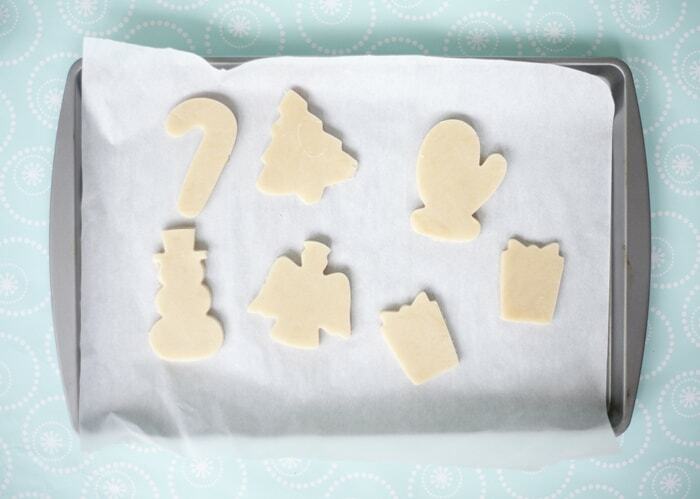 Tip #6: Baked cookies can also be frozen for up to 2 months. 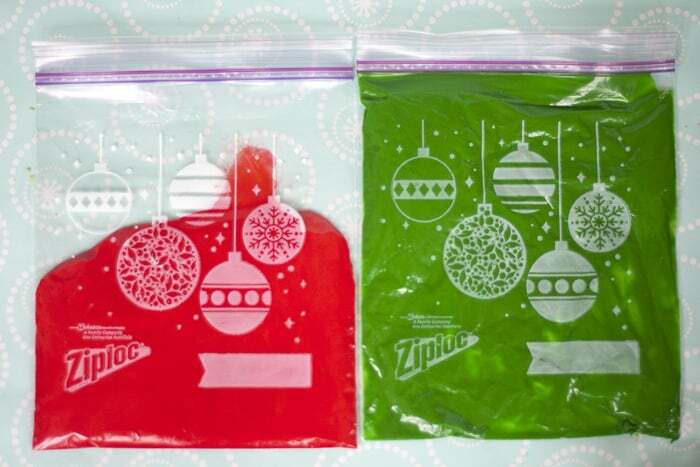 Make sure they are completely cooled before packing in an airtight rigid container separated by layers of freezer paper. For these minis I just place them in a bag and freeze until I need them and then let them thaw completely before decorating. 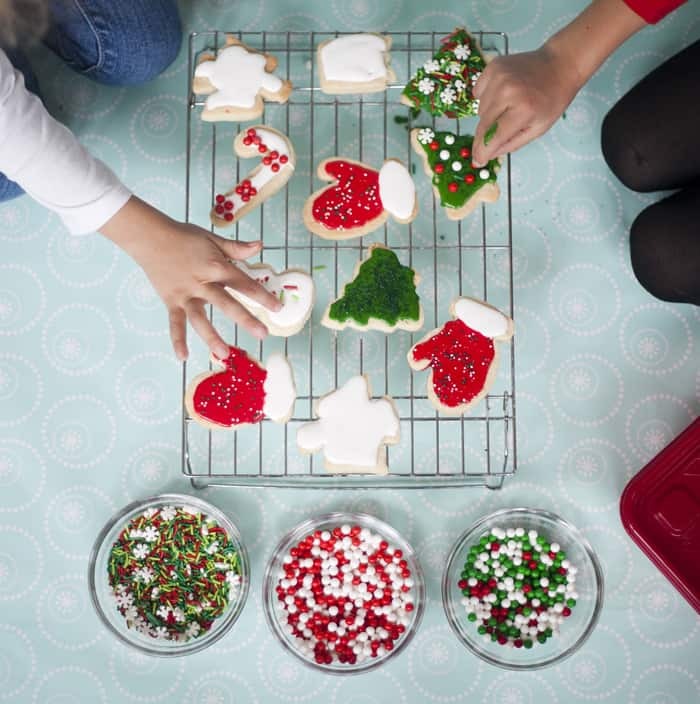 Tip #7: Now that the girls love to help with all aspects of cookie decorating, I like to make the icing as easy to manage as possible. 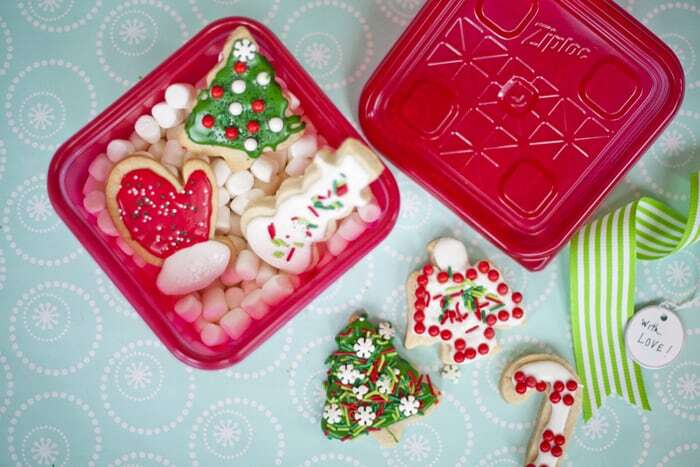 Rather than using a piping bag, I pour the icing into a Ziploc® Holiday Storage Bag with the corner snipped so the kids can easily squeeze the icing onto the baked cookies. This is also a really affordable solution if you have LOTS of colors or lots of helpers. 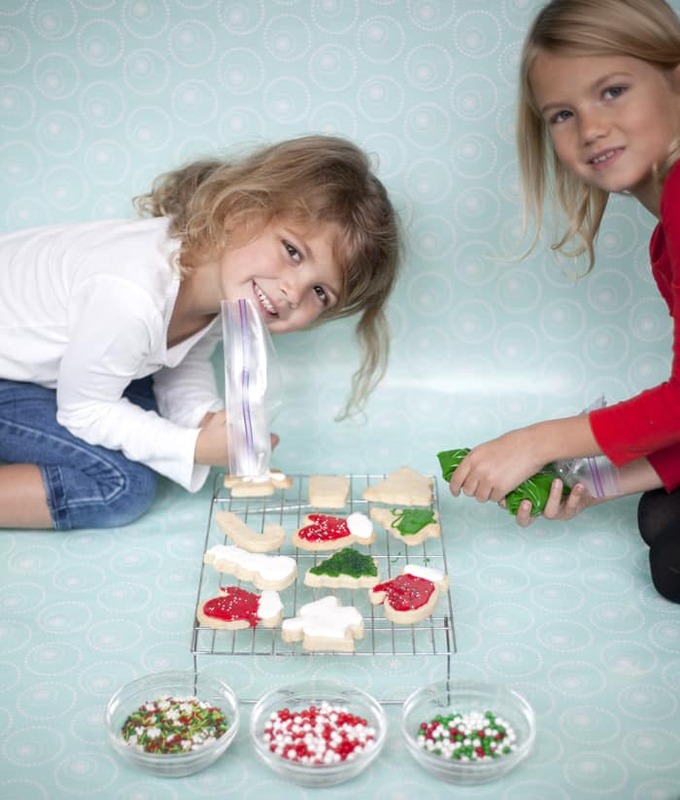 Tip #8: Place sprinkles and candies into small bowls before the kids go to work. This will save you from “pouring” disasters. 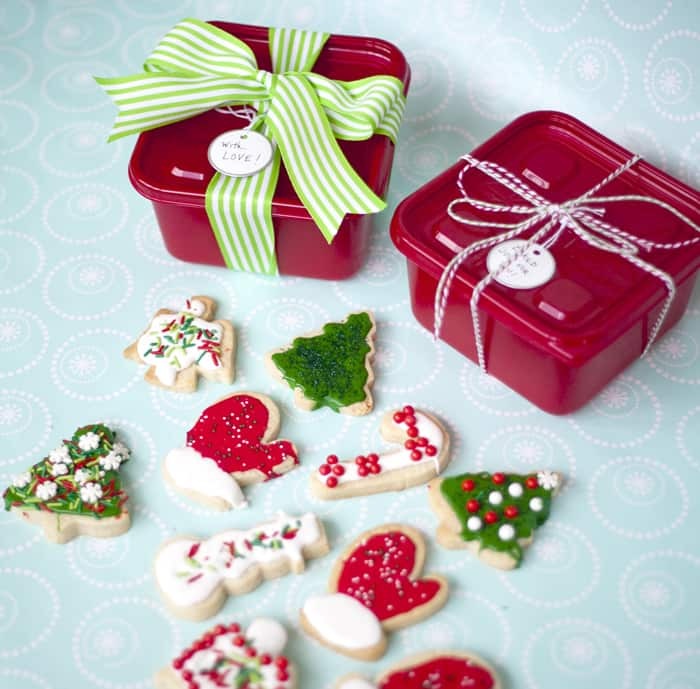 Tip #9: Package baked goods for sharing in inexpensive containers that you don’t expect returned like these festive Ziploc® Holiday Collection Containers. 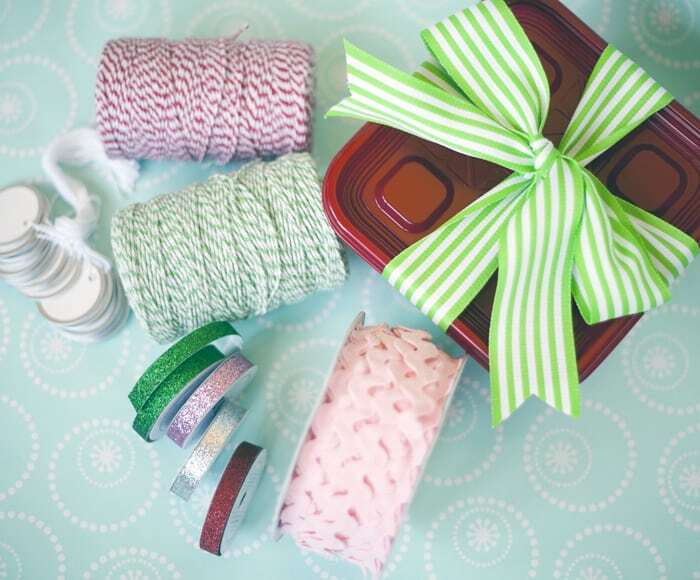 Add pretty bows, twine and tags to make them special. 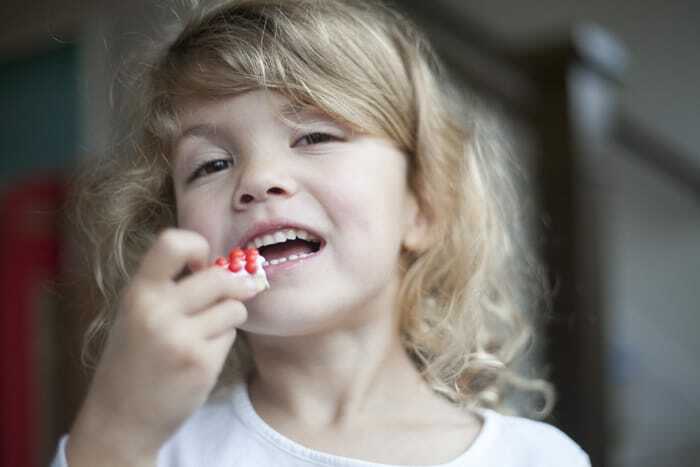 Tip #10: Get creative with padding and use marshmallows or soft peppermints to cushion your treats for special delivery. Most of all, have fun! And don’t forget to save a couple of treats for yourself!